This is a rousing tale of Robin Hood featuring one of his merry “men”, Will Scarlet, who disguises herself as male and keeps her painful past hidden. Complete with the traditional cast of characters in Robin Hood tales, Scarlet stands out because the story is not told from Robin’s point of view. For those familiar with Robin Hood, the reader can easily guess the identity of Will Scarlet, and that is just fine. What the reader doesn’t know is how she came to be disguised as a boy and how she joined Robin. 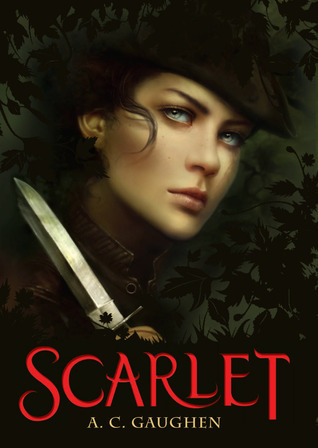 Scarlet is a natural fighter full of gutsy determination and a need to help others at her own expense. Excellent writing clearly describes the action, quite a great deal of fighting and near misses, also describes the horrible fate in life to be a mere peasant. I eagerly await the sequel, Lady Thief, to be published 2.11.14. Highly recommend. This entry was posted in 8/13 Staff Dev, adventure, folklore, highly recommend and tagged Robin Hood. Bookmark the permalink.